Screen shot of the game Alliance from Pretty Good Solitaire. Alliance is a two deck game. It is a variation of the game Matrimony. 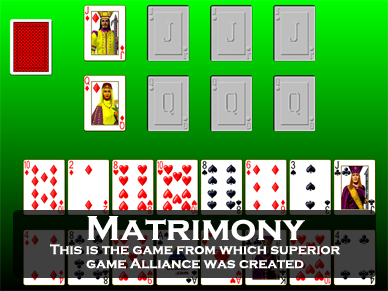 Matrimony is a very difficult game to win, but Alliance changes some rules towards the end of the game to give the player a fighting chance. At the start of the game, the Jack and Queen of Diamonds are dealt to start two foundation piles. There are eight foundation piles total, four are built from Jacks down in suit to Aces, then King and Queen. The other four are built from Queens up in suit to King, Ace, and then up to Jack. The game is won when all of the cards are built to the foundations. 16 cards are dealt out one each to 16 tableau piles. The remaining cards form a stock. Play begins by making any possible moves from the tableau piles to the foundations. Cards cannot be moved between tableau piles at this stage. When there are no more moves, click on the stock to deal one card to each tableau pile. Again make any possible moves to the foundations. Continue in this way until the stock is empty. Once the stock is empty and there are no more possible moves to the foundations, the next stage of the game begins. Clicking on the empty stock will do a redeal of the tableau piles. Here is how the redeals are done: The cards in the last pile of the last row are picked up and turned over. The top card (which was the bottom card before the pile was turned over) is dealt to the pile where the cards were taken, the remainder are dealt to the first pile in the first row and across until the cards run out. Then make any moves to the foundations. Once all moves are made, another redeal is done for each pile in the tableau, moving from the bottom right pile to next pile to its left. There are 16 redeals in all, one for each pile. After the 16th redeal, the game is usually not yet won. There are usually some cards still remaining in some of the tableau piles. This is where the game enters its final stage. In this final stage, you can finally move cards between tableau piles. You can build the tableau piles up or down by suit. This will usually allow you to transfer some cards and possibly clear some piles that were blocked. It is this final stage that makes Alliance different and easier than Matrimony. 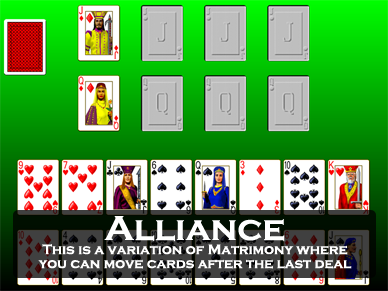 Alliance is one of the 850 games in Pretty Good Solitaire.